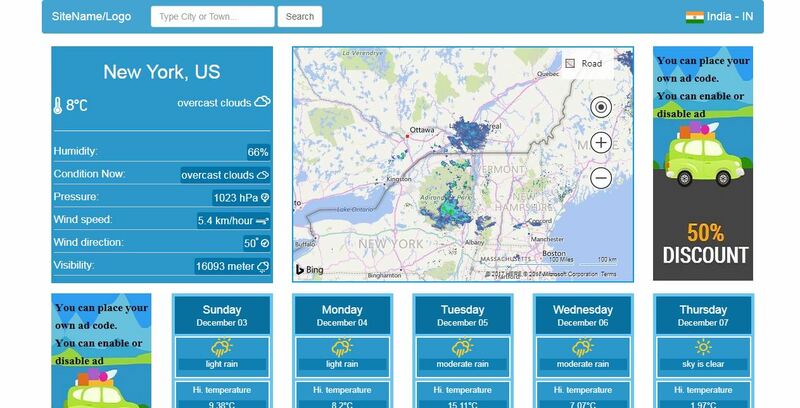 Attention please: Check our new weather forecast PHP script on https://codecanyon.net/item/dark-sky-weather-forecast-php-script/22938123 and live demo on https://www.codespeedy.com/demophp/dark_sky_weather_forecast/ . It is using Dark Sky API and allow 1000 request per day in free of cost. In Ajaxify Weather Forecast PHP Script, you just need to put the city or town name in the text box and then submit it. After that, the current weather data and forecast of next 5 days with chart will be appeared without loading the whole page. This script is using OpenWeatherMap API to fetch the weather data. See the live demo of Ajaxify weather forecast script. Get the source code of PHP Ajaxify weather forecast script. Completely responsive and mobile friendly with a clean and beautiful eye-catching design. This PHP app looks very nice on both mobile and desktop device. Display the current weather states and weather forecast for next 5 days for a particular city or town. Beautifully designed chart using chartjs to display the maximum and minimum temperature for next 5 days forecast. A huge amount of city and town available to search for to see the current weather states and weather forecast as this script using OpenWeatherMap API. Automatically detect location and show weather states for that particular location in default. There is two ad space for desktop and two ad space for mobile available where you can easily put your advertising code, enable or disable any ad for mobile or desktop just from one configuration file. For example, you can disable a mobile ad space and enable the other. Similarly, you can do the same thing with the two desktop or PC ad space. Also, you can disable all the mobile ad space and only enable desktop ad space and vice versa. If you disable all the ad space, then the design will automatically cover the space. Nice ad management system so that you can monetize this PHP app. No database required for this PHP weather forecast script. Completely work on AJAX and thus the script work very fast. No page load required. Well documentation available with this script which instructs you where to put API keys, how to enable/disable ad for mobile and desktop and many more. Easily change settings and configuration, enable/disable ad and much more just from one configuration file. Easy to customize the CSS file or use your own CSS code to customize the design. And much more features available in this script. You can download the source code of this PHP script from here. If you want to see the live demo then please visit here. If you want to order a customized weather forecast PHP script using OpenWeatherMap or using any other types of API then contact us. « How To Generate Random Password In PHP?